FAYETTEVILLE – The Razorbacks secured two run-rule victories over Furman on Sunday (April 14), outscoring the Paladins 11-0 in game one and 9-1 in game two. Arkansas has now won five-straight games and will look to continue that streak when they host UAPB in more non-conference play on Tuesday (April 16). Starter Autumn Storms is now 16-5 after recording her third shutout and 11th complete performance of the season. 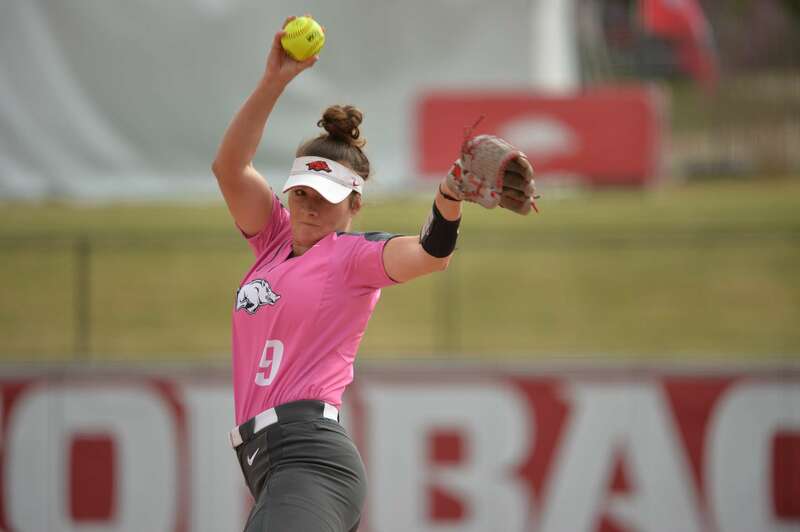 Storms needed only 73 pitches to close out game one for the Razorbacks, she gave up no free bases for the 15th time this season and fourth-straight appearance. Behind Storms, the Razorback bats were fired up, scoring four runs in the first inning and three in the second to give the Hogs a steady 7-0 lead. Arkansas (31-14) batted through the entire lineup in the first inning, starting with three consecutive base hits from Hannah McEwen, Danielle Gibson and Ashley Diaz. Gibson would be the first Hog to score after sophomore Kayla Green was hit by a pitch with the bases loaded. A single to left field by junior Sydney Parr and a bases-loaded walk by Nicole Duncan would score two more for Arkansas. Green made her way around the bases and scored on a passed ball by the Furman catcher to tally the fourth Razorback run of the inning. Arkansas stayed on the gas pedal in the second, scoring three runs with the help of senior Katie Warrick and Green. The final offensive push came in the fourth inning, as sophomore shortstop Keely Edwards took advantage of a bases-loaded situation to send a 1-0 count into left center for her second double in as many days. Edwards’ hit cleared the bases and gave Arkansas the leverage it needed to take game one in five innings. After an all-star performance in Arkansas’ extra-inning win over the Paladins on Saturday, Haff returned to the circle for the Razorbacks in game two, and held Furman to only one hit through five innings of work. Haff’s one-hitter is her third of the season, it also marks the sixth time she has held an opponent to one run or less as a starter. Furman was the first to score in the contest, plating a run from a leadoff walk and a passed ball. The Razorbacks picked up where the left off in game one, scoring five in the bottom of the inning with runs batted in by Diaz, Green, and senior Haydi Bugarin. Bugarin gave the Razorbacks the 5-1 lead after the first frame with a three-run home run to right field. With two outs on the board in the second and Razorbacks on first and second, Warrick hit a single to center field. The hit scored Gibson from second and Arkansas took a 6-1 lead. After a scoreless third inning, Warrick delivered again in the fourth, scoring Diaz from second base. Freshman Sam Torres entered in Warrick’s spot to pinch run for Arkansas and used her speed to score her 11th run of the season with a single to right field from Green. Now leading 8-1 through five frames, Arkansas needed only one additional run to end the game and secure the run-rule victory. For the second day in-a-row, it would be a Razorback pinch-hitter that would get the job done. Sophomore Linnie Malkin was called on with Edwards on first and one out on the board, Malkin drove the 2-0 count down the left-field line and Edwards scored to call the game for the Hogs. Diaz has now recorded four consecutive multi-hit games; she now has 12 this season and 50 in the cardinal and white. Diaz is only one hit away from her 200th career hit and three hits from ranking seventh all-time at Arkansas for career hits. While five Razorbacks recorded multi-hit games on Sunday, Green was the lone Hog to record two multi-RBI performances with two runs batted in, in both contests. Arkansas is now 18-1 when scoring in the first inning. McEwen has now reached base safely in 41 of 44 games this season. Arkansas will continue the nine-game homestand with a mid-week contest with UAPB on Tuesday (April 16) before hosting No. 7 LSU starting Thursday (April 18). For all Razorback softball news and information, go to ArkansasRazorbacks.com and follow the Hogs on Twitter at @RazorbackSB, on Facebook at Razorback Softball and on Instagram at @Razorback_SB. Fans can also follow head coach Courtney Deifel on twitter at @CoachDeifel.